Diskectomy is surgery to remove all or part of the cushion that helps support part of your spinal column. These cushions are called disks, and they separate your spinal bones (vertebrae). 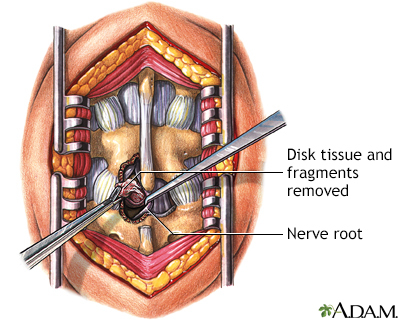 A surgeon may perform disk removal (diskectomy) in these different ways. Microdiskectomy: When you have a microdiskectomy, the surgeon does not need to do much surgery on the bones, joints, ligaments, or muscles of your spine. Diskectomy in the lower part of your back (lumbar spine) may be part of a larger surgery that also includes a laminectomy, foraminotomy, or spinal fusion. Diskectomy in your neck (cervical spine) is most often done along with laminectomy, foraminotomy, or fusion. 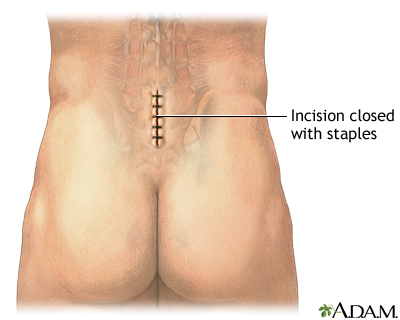 Microdiskectomy is done in a hospital or outpatient surgical center. You will be given spinal anesthesia (to numb your spine area) or general anesthesia (asleep and pain-free). The surgeon makes a small (1 to 1.5-inch, or 2.5 to 3.8-centimeter) incision (cut) on your back and moves the back muscles away from your spine. The surgeon uses a special microscope to see the problem disk or disks and nerves during surgery. The nerve root is located and gently moved away. The surgeon removes the injured disk tissue and pieces of the disk. The back muscles are returned to place. The surgery takes about 1 to 2 hours. Diskectomy and laminotomy are usually done in the hospital, using general anesthesia (asleep and pain-free). The surgeon makes a larger cut on your back over the spine. Muscles and tissue are gently moved to expose your spine. A small part of the lamina bone (part of the vertebrae that surrounds the spinal column and nerves) is cut away. The opening may be as large as the ligament that runs along your spine. A small hole is cut in the disk that is causing your symptoms. Material from inside the disk is removed. Other fragments of the disk may also be removed. When one of your disks moves out of place (herniates), the soft gel inside pushes through the wall of the disk. The disk may then place pressure on the spinal cord and nerves that are coming out of your spinal column. 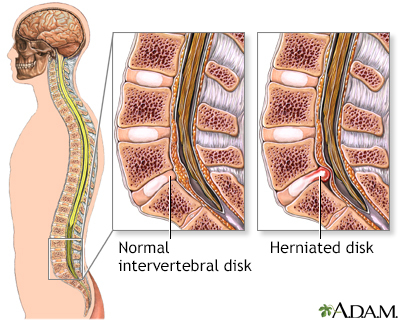 Many of the symptoms caused by a herniated disk get better or go away over time without surgery. Most people with low back or neck pain, numbness, or even mild weakness are often first treated with anti-inflammatory medicines, physical therapy, and exercise. Only a few people with a herniated disk need surgery. If you are having problems with your bowels or bladder, or the pain is so bad that strong pain medicines do not help, you will probably have surgery right away. Tell your health care provider what medicines you are taking, even medicines, supplements, or herbs you bought without a prescription. Prepare your home for when you come back from the hospital. If you are a smoker, you need to stop. Your recovery will be slower and possibly not as good if you continue to smoke. Ask your provider for help. Two weeks before surgery, you may be asked to stop taking medicines that make it harder for your blood to clot. These include aspirin, ibuprofen (Advil, Motrin), naproxen (Aleve, Naprosyn), and other medicines like these. If you have diabetes, heart disease, or other medical problems, your surgeon will ask you to see the doctors who treat you for those conditions. Talk with your provider if you have been drinking a lot of alcohol. Always let your provider know about any cold, flu, fever, herpes breakout, or other illnesses you may have. You may want to visit the physical therapist to learn some exercises to do before surgery and to practice using crutches. Bring your cane, walker, or wheelchair if you have one already. Also bring shoes with flat, nonskid soles. Your provider will ask you to get up and walk around as soon as your anesthesia wears off. Most people go home the day of surgery. DO NOT drive yourself home. Follow instructions about how to care for yourself at home. Most people have pain relief and can move better after surgery. Numbness and tingling should get better or disappear. Your pain, numbness, or weakness may not get better or go away if you had nerve damage before surgery, or if you have symptoms caused by other spinal conditions. Further changes may occur in your spine over time and new symptoms may occur. Talk with your provider about how to prevent future back problems. Ehni BL. 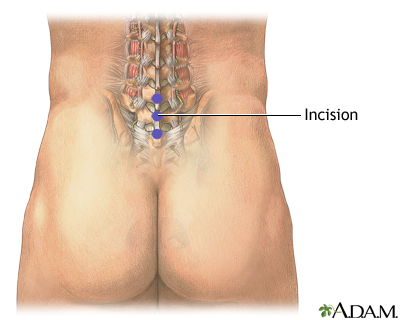 Lumbar discectomy. In: Steinmetz MP, Benzel EC, eds. Benzel's Spine Surgery. 4th ed. Philadelphia, PA: Elsevier; 2017:chap 93. Gardocki RJ. Spinal anatomy and surgical approaches. In: Azar FM, Beaty JH, Canale ST, eds. Campbell's Operative Orthopaedics. 13th ed. Philadelphia, PA: Elsevier; 2017:chap 37. The spine is surrounded by many muscles and ligaments which give it great strength and flexibility. If these muscles or ligaments become damaged, back pain results. The spinal cord ends in the lumbar area and continues through the vertebral canal as spinal nerves. Because of its resemblance to a horses tail, the collection of these nerves at the end of the spinal cord is called the cauda equina. These nerves send and receive messages to and from the lower limbs and pelvic organs. 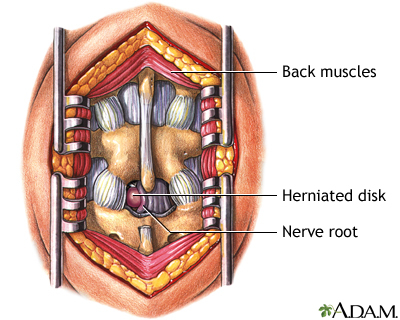 Spinal stenosis is a narrowing of the lumbar or cervical spinal canal. The narrowing can cause compression on nerve roots resulting in pain or weakness of the legs. Medications or steroid injections are often administered to reduce inflammation. If the pain is persistent and does not respond to these conservative measures, surgery is considered to relieve the pressure on the nerves.